A proposal for a philosophical foundation and a realistic deliberative mechanism for creating a transnational common law for the environment. 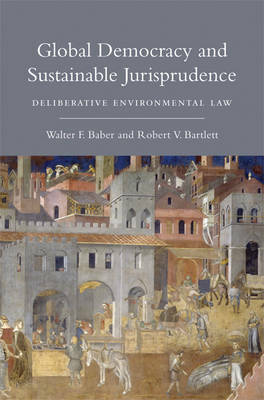 In Global Democracy and Sustainable Jurisprudence, Walter Baber and Robert Bartlett explore the necessary characteristics of a meaningful global jurisprudence, a jurisprudence that would underpin international environmental law. Arguing that theories of political deliberation offer useful insights into the current "democratic deficit" in international law, and using this insight as a way to approach the problem of global environmental protection, they offer both a theoretical foundation and a realistic deliberative mechanism for creating effective transnational common law for the environment. Their argument links elements not typically associated: abstract democratic theory and a practical form of deliberative democracy; the legitimacy-imparting value of deliberative democracy and the possibility of legislating through adjudication; common law jurisprudence and the development of transnational environmental law; and conceptual thinking that draws on Deweyan pragmatism, Rawlsian contractarianism, Habermasian critical theory, and the full liberalism of Bohman, Gutmann, and Thompson. Baber and Bartlett offer a democratic method for creating, interpreting, and implementing international environmental norms that involves citizens and bypasses states-an innovation that can be replicated and deployed across a range of policy areas. Transnational environmental consensus would develop through a novel model of juristic democracy that would generate legitimate international environmental law based on processes of hypothetical rule making by citizen juries. This method would translate global environmental norms into international law-law that, unlike all current international law, would be recognized as both fact and norm because of its inherent democratic legitimacy.